Help ! My wallet is on fire !! Name almost any item, chances are you can find someone who collects it. 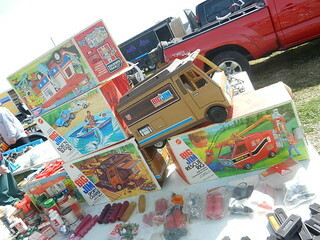 If you are a regular reader of DetroitDvotion, you are aware of our fondness for old things. Today I’d like to share with you two events that highlight some of our favorites. 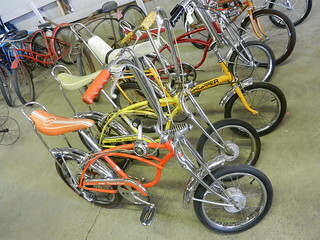 Lets begin in Ann Arbor; every April the Washtenaw County Fairgrounds become home to one of the largest classic bicycle shows and swap meets in the nation……really. We pulled into the fairgrounds around 10am, the scene was unbelievable; a line of cars driving over grassy areas looking for parking, moving trucks, vans and pick-ups stacked high with old bikes, grown men riding mini bikes through the swap area and of course, thousands of antique and classic bikes available for purchase or your viewing pleasure. One of the hardest things about coming to an event like this is deciding where to start; we began outside in the swap meet area. It is impossible to describe; the sheer volume of bicycles and other vintage items is astounding. Along with complete bikes ranging from pre-war to BMX style, there were pile after pile of tires; raised white letter, balloon, white side walls, and striped. Mounds of handlebars rest on tables, some still in the original packaging. Looking for a headlight, saddle bag, rear-view mirror or a basket to hang on your handlebars? They’ve got it! 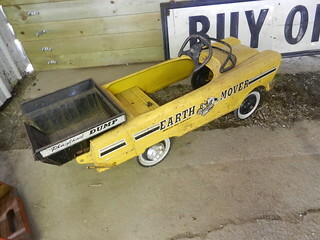 Fenders, reflectors, shifters, horns, forks and banana seats can be yours for the right price. 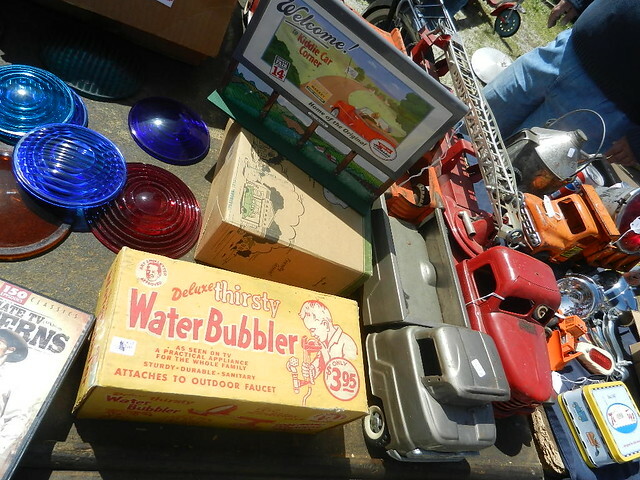 Along with bicycles there was an assortment of other vintage items; toys, games, fire extinguishers, GI Joe and pedal cars; for anyone who likes antiquing this event is a treasure trove of childhood memories. Once we finished the swap spaces we headed over to the buildings; more of the same items as outside, but these tend to be a little nicer, and a little more expensive. Aisle after aisle we saw familiar brands such as Columbia, Schwinn, Raleigh, Huffy and Murray. Department store brands like Sears and JC Penney sat side by side with less familiar names; JC Higgins, Auto Cycle, Vista, and Ross. 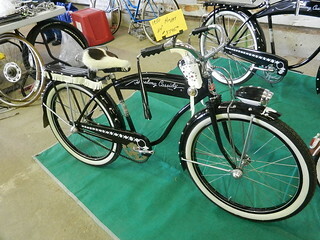 Have you ever seen a a Huffy Radio Bike, how about a Hopalong Cassidy? There was a display with five or six of them in perfect condition; complete with holsters and cap guns dating back to the 50’s. 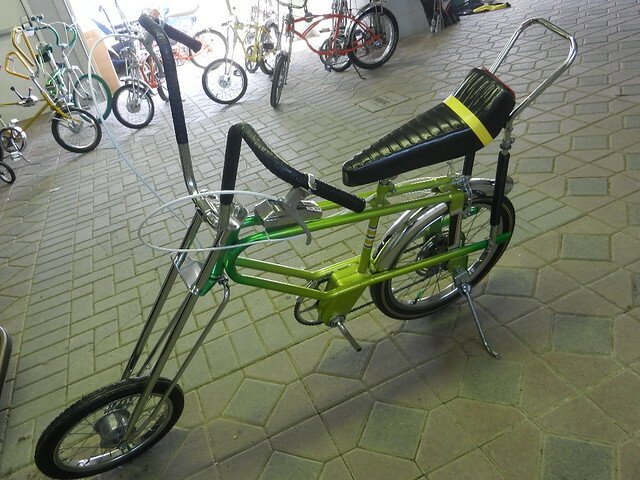 I like bikes from the late 60’s to early 70’s, you know, hi-rise handle bars, banana seats and sissy bars. They come it great colors, the paint often metallic or candy apple. 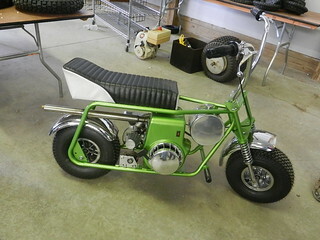 Some have that drag racer feel like the Slingshot, Chopper or Dragstripper. Sporting a 16 inch front tire and a 20 inch rear slick they came with cool chrome shifters and colorful decals. 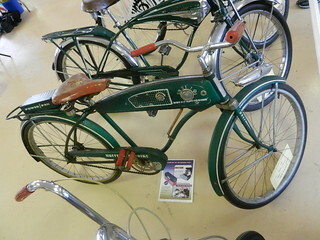 Through the years bicycle design often copied popular automotive design of the period. 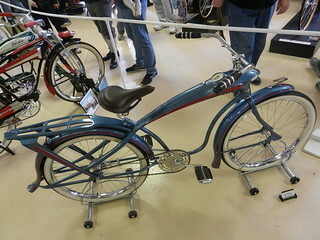 The main building is home to the Show Bikes; 50-75 bicycles are entered into one of 11 categories, the public votes for its favorites, awards are presented to first-place winners.The Classic Bike Of The Year Award is the only judged category; it is usually made up of the finest, rarest and most sought-after models, all from private collections. Bicycles such as these can be worth thousands of dollars. 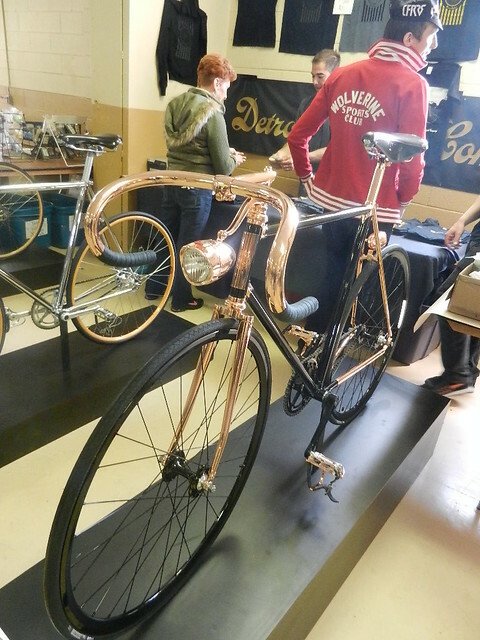 Also on exhibit was a brand new bike from the Detroit Bicycle Company called the Madison; painted black with copper plating it’s quite eye-catching! You can’t help but enjoy yourself walking around the grounds; bicycles have a way of bringing back fond childhood memories. Did you ever have a paper route? How about the bike Santa Clause brought? Was your first bike new from the store or a hand-me-down? It’s not too late to get the bike you always wanted as a kid, just mark your calendar, I’ll see ya next April! Back in the car, we needed to get from Ann Arbor to Southfield for the Michigan Modernism Exposition, but first we needed to stop and grab lunch. Not far from Southfield is the modest city of Berkley; home to an ever-increasing number of restaurants and cafes, we thought we’d try something new. Graced with another beautiful day filled with sunshine and a clear blue sky, the patio at Amici’s Living Room was the perfect choice. 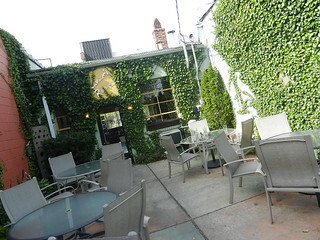 The space itself is surrounded by ivy covered walls, gardens, pretty pots of flowers and garden art, all very charming. Service was quick, which was good since we were in a hurry. 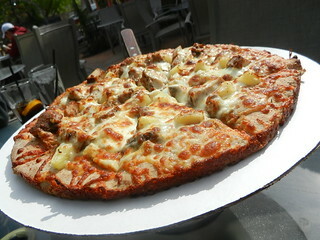 We ordered the Caribbean Spicy Jerk Chicken Pizza: Spicy jerk chicken, peanut ginger sauce, pineapple and mozzarella cheese on the whole wheat crust. All pizza’s come with their unique whole wheat pesto breadsticks…these are seriously good. They arrived fresh from the oven all warm and delicious, served with a side of chunky tomato sauce, we could have made a meal out of them! Next came the pizza, definitely unusual, but a great combination of flavors, all piled on the same delicious crust as the breadsticks. With no time to linger and enjoy the patio, we were back in the car on our way to the Southfield Pavilion on Evergreen Road. 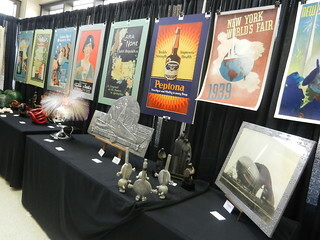 Hosted annually by the Detroit Area Art Deco Society, the Michigan Modernism Exposition attracts dealers from around the Midwest ; it’s worth the price of admission just to walk around. 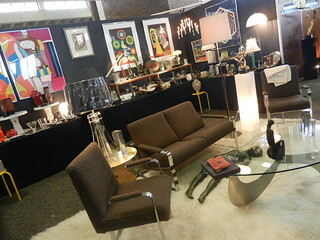 Pieces on display range from the streamlined look of the Art Deco era to the funky colorful items of the mid to late century; we like ’em all. The show area is one large space divided into different booths or rooms, several times I would have loved to point and say “I’ll take that room”. 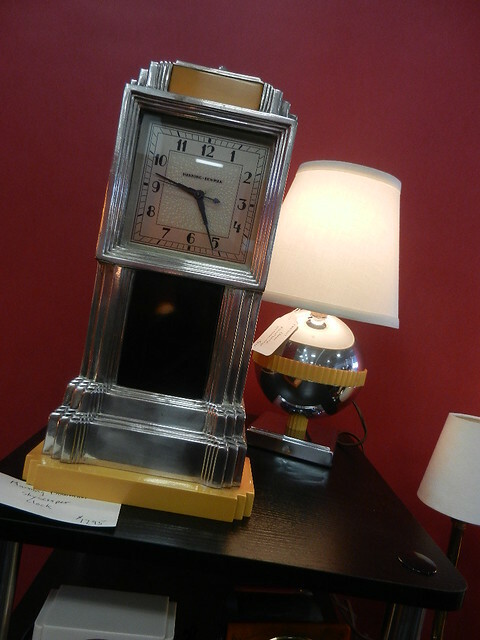 The Art Deco articles are highly detailed, lots of stainless steel and shiny black surfaces; there were a number of clocks that were amazing. 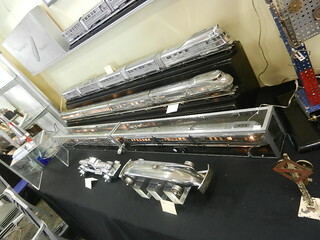 Decorative items such as coffee servers, light fixtures and sculptures made wonderful eye candy. 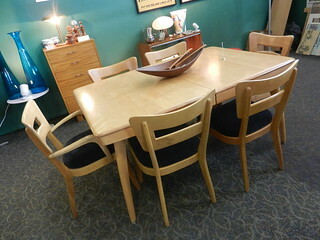 As we walked around we traversed in and out of decades; one space featured a complete Heywood Wakefield dining room set making it seem like we walked right into 1950. We saw white shag carpet, kidney-shaped tables, tulip chairs and brightly colored plastic. There was lucite and polished chrome, colored glass and bakelite. Colors are vibrant; orange, red, turquoise and bright blue. All the names you would expect to see are there : Eames, Knoll, Herman Miller and Panton; I find the knock-offs equally appealing. 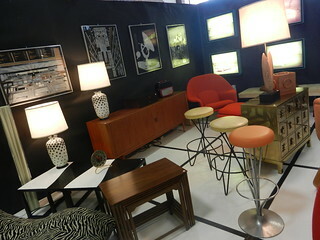 You could completely re-do your home with the furniture and accessories for sale at the expo. The vintage jewelry is exceptional, I’m not picky, diamonds or rhinestone, I adore them equally. The variety of artwork this year was wonderful; from paintings and photographs to huge posters, any wall would be happy to display them. Coming here reminds me of when I was a kid and my parents would take me with them furniture shopping; I would look at each room display and try to imagine myself living there. I could be happy living in any one of these!